This week I’m over at TravelingMom talking about one of the Midwest’s hidden gems. If you’ve been around long, you know that I’m all about destinations that are a bit off the beaten path. Since we moved to Michigan, we drive right by Fort Wayne at least a few times a year. It’s only an hour and a half from us here in Southeastern Michigan, and it’s directly on our route back to visit family in Kansas City. But before being invited there this Spring by Visit Fort Wayne, all I could really tell you was that it was the home of Vera Bradley (because our exit took us right by their headquarters building)! As usual, I fell completely in love with this destination and I truly cannot believe that more people aren’t raving about what a wonderful place it is to visit. Fort Wayne isn’t always the first place that pops into your mind when you think about planning a weekend getaway in the Midwest. But it should be. 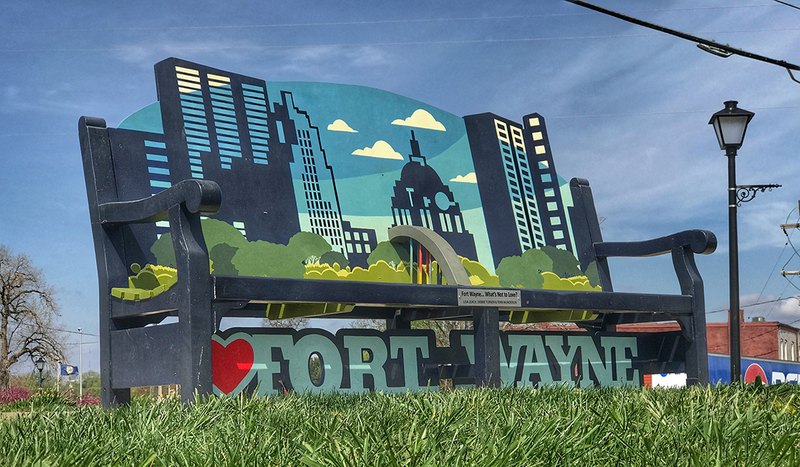 A hidden gem known mostly to devoted Vera Bradley fans, Fort Wayne offers a wide variety of family-friendly activities amidst the charm and friendliness you expect from the Midwest. Bench near the Wells Street Bridge – part of a collection commissioned from local artists. Hop on over to TravelingMom to read the article!